Successful aboard Pineau De Re 12 months ago, Leighton Aspell was never too far off the pace and Many Clouds, winner of the Hennessy Gold Cup at Newbury earlier in the season and sixth in the Cheltenham Gold Cup, jumped with aplomb throughout. 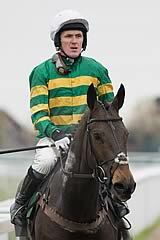 For a long way it appeared Shutthefrontdoor could provide Tony McCoy with a fairytale second National triumph before his retirement, but he eventually weakened into fifth place, and though Many Clouds tired from the elbow, he had enough in the tank to hold off Saint Are. The first two home were both 25-1 shots, with Monbeg Dude (40-1) third and Alvarado (20-1) fourth. "We really refreshed and recharged his battery, and I tried to conserve energy. He is all heart - all season he has had hard races. Win lose or draw, that's the best ride I have had in the National. I just hoped his battery life lasted out and it did." 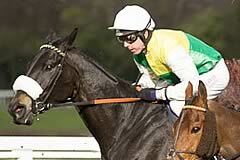 The win was a third in the National for owner Trevor Hemmings after Hedgehunter (2005) and Ballabriggs (2011). "The horse has been unbelievable all season, he has blossomed all year - he just got out of bed the wrong way in the Gold Cup. 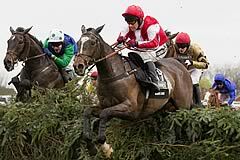 I didn't show him any National fences on purpose, I thought he had just gone over the top before the Gold Cup. "I didn't see my horse come back in, so I was a bit worried, but I gather he was just a bit wobbly and he's OK. Jumping the last I couldn't watch. I watched the race on my own and the poor people beside me - I lost it completely! "I still don't know what happened in the Gold Cup. He definitely didn't run his race, nothing against the winner (Coneygree). I've done nothing with this horse since Cheltenham. He hasn't seen a National fence. I didn't think it was the right thing to do. He's done two quiet bits of work and that's all I've done with him. "It gave me a bit more confidence this week when (Silviniaco Conti) ran so well and Holywell didn't run badly, so the Gold Cup form was working out. Luckily this year there's an extra week from Cheltenham to Aintree, which has made a huge difference. "I'm going to really enjoy this one - I'm in cloud cuckoo land! Hemmings added: "Seriously, it was incredible. You come to the National and you dream that you win it. When a third comes along, that is something special. It is a wonderful, wonderful feeling. "For years and years this race has captured my heart. What a wonderful feeling, you can't express it. 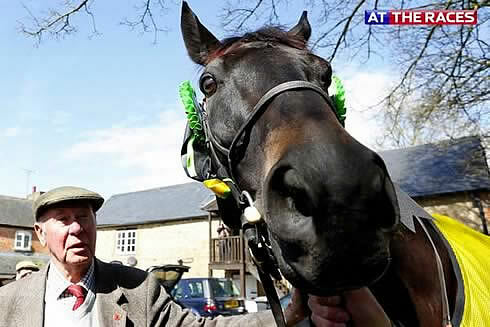 Thank you Oliver Sherwood, thank you Leighton and all the staff, and, of course, Aintree." Making his first appearance in the Crabbie’s Grand National, Saint Are delighted his connections with a strong performance in second. 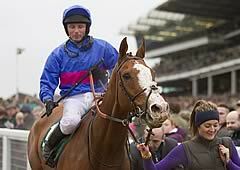 There was a sense of deja vu for trainer Fergal O’Brien, jockey Paul Moloney and owners William and Angela Rucker, who welcomed Alvarado back into the fourth spot for the second year running, extending the owners’ and jockey’s record to seven consecutive top four finishes in the race. 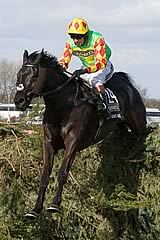 Sam Twiston-Davies, Rocky Creek, 17th: He pulled a shoe off. He was beaten too far out to say it was his genuine running, but he was on and off the bridle and uncomfy from an early stage. Aidan Coleman, The Druids Nephew, fell 26th: “He just got in a bit deep, running really well, travelled like a dream, I’m absolutely gutted. Tom O’Brien, 10th on Chance Du Roy: “I was flat out all the way, but he’s a legend and did what he could.